The College of Southern Nevada Coyotes rebounded nicely after falling out of the national Top-20 poll last week. The Coyotes (16-11 overall, 3-5 conference) used some qualify pitching to win three out of four games from the College of Southern Idaho (16-14, 5-3). Sophomore Blair Goldsack and freshman DJ Myers were the standouts in the Coyote rotation. Goldsack, who leads all CSN starters in both wins (4-1) and ERA (2.10), pitched seven innings and allowed just two runs on three hits while striking out four in a 3-0 win in the opener. Myers, who has also had a solid season thus far with a 2-1 record with a 2.37 ERA, also was outstanding against the Golden Eagles in Game 2, allowing two runs (one earned) on three hits while striking out four over seven innings in a 3-2 victory. Wes Grass pitched two hitless innings in relief to pick up the save, striking out three. 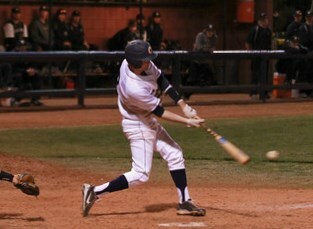 Offensively, Grant Heyman led the way for the Coyotes by going 7-for-14 with four RBIs, three doubles and a triple. Since conference play begun, Heyman has improved his average from .286 to .367. Sophomore third baseman Brandon Pletsch also had a nice series against Southern Idaho, going 5-for-15 with three RBIs and two doubles. The Coyotes next host rival Western Nevada (19-9, 4-4) for a four-game series at Morse Field beginning with a doubleheader on Thursday afternoon beginning at 3 p.m. The series concludes with another doubleheader on Friday beginning at 1 p.m.